JustChair Manufacturing provides superior quality seating solutions to the hospitality industry. Our products, which are backed with a premium 5-year warranty, come in wood and metal configurations. All wooden chairs and tops are made from quality German beechwood - CNC, ISO9001 cut and precision built to last. JustChair's metal offerings are built from heavy-duty 18-gauge steel that is treated for rust prevention. The complete furniture line includes all types of indoor and outdoor seating arrangements: from a wide assortment of banquet-style chairs to space-saving quick-ship and hand-tufted booths - even plywood outdoor stackable chairs. We currently have 2 distribution centers: one in Maspeth, NY and the other in Stone Mountain, GA. With competitive pricing, prompt deliveries and attentive professional service, we are committed to provide long-lasting satisfaction for our customers. Our products are available via restaurant equipment dealers, designers and contractors nationwide. 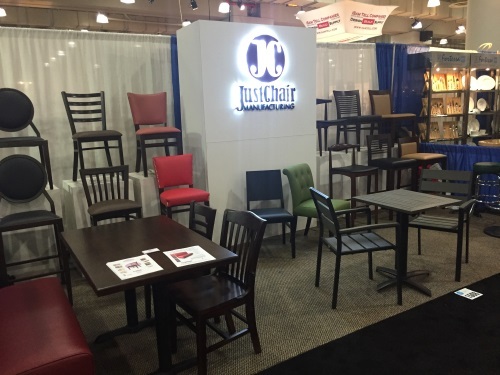 JustChair participates in national and regional trade shows throughout the year. Subscribe to our newsletter to receive information on our next show.